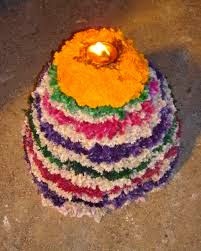 Bathukamma is a prominent festival celebrated in Telangana a state of India.This denotes the culture of india to pray nature as it is festival of flowers.It is celebrated during the time of dasara Navarathri. It starts on Amavasya and ends on ashtami.The flowers are prayed as Goddess Lakshmi and Gouri Devi.Bathukamma means life giver. -->It starts on Amavasya where there is no moon and ends on ashtami which is half of half Lunar Cycle.This denotes that we have to develop in our life. -->This festival indicates the beginning of Sharath Ruthu. -->Here flowers are prayed as God this denotes how nature is prayed as god here. -->Girls form small groups and play around all Bathukammas made by all.They sing small songs each phrase ending with "Uyyalo" this denotes love towards god and feel god as small kids. -->This denotes women empowerment and the freedom given to women in olden days.In songs there are moral stories,epics and current News. -->Every day after playing Bathukamma they again nimarjan into water.This denotes how to preserve nature and a ethical sense that where ever may we start but we end at same things. -->Goddess Gauri killed 'Mahishasura' the demon after a fierce fight. After this act, she went to sleep on the 'Aswayuja Padyami', due to fatigue. The devotees prayed to her to wake up, and she woke up on the Dasami. -->Bathukamma, as the daughter of the Chola King 'Dharmangada' and 'Satyavati'. The king and queen lost their 100 sons in the battlefield and prayed to Goddess Lakshmi to be born in their house, as their child. Goddess Lakshmi heard their sincere prayers and chose to oblige them. When Lakshmi was born in the royal palace, all the sages came to bless her and they blessed her with immortality "Bathukamma or Live Forever". This is just my self analysis please forgive me if I am wrong any where.I always accept any suggestions.